Remote sensing can be defined as the art and science of obtaining information about Earth (or, for that matter, other planets) features from measurements made at a distance. It is an essential part of modern geography, but also has extensive military applications, especially in imagery intelligence and measurement and signature intelligence, but also in warfare itself, for such things as battle damage assessment. facilitates studies of how features/areas change over time. Because much of the spatial data used in GIS is based on remotely sensed images, the software systems designed for GIS and those designed for the processing of remotely sensed images are intimately related, and many of the major GIS packages include at least basic image processing capabilities, and image processing applications vice versa. The image processing capabilities of most GIS platforms consists primarily of geometric and spectral correction, rectification and classification utilities. Remotely sensed data may be analyzed either independently of, or in conjunction with, other digital data layers (e.g., in a GIS). In the United States intelligence community, geospatial intelligence is a term of art for the combination of images with precise locations of the placed being imaged; the term also can be applied to non-imaging intelligence collection technologies for which the exact location is important. The target itself may produce emitted radiation, such as the glow of a red-hot object, which Sensor 2 measures. 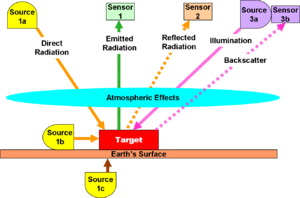 Alternatively, Sensor 1 might measure, as reflected radiation, the interaction of the Target with Source 1a, as in conventional sunlit photography. If the energy comes from Source 1b, Sensor 1 is doing the equivalent of photography by flash. A bistatic remote sensing system would separate source 3a from sensor 3b; a multistatic system could have multiple pairs of coupled sources and sensors, or an uneven ratio of sources and sensors as long as all are correlated. It has significant value in sensing in shallow water operations. 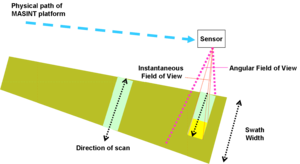 Techniques such as synthetic aperture radar have source 3a and sensor 3b colocated, but the source-sensor array takes multiple measurements over time, along the flight path of a moving aircraft or satellite, giving the effect of physical separation of source and sensor. Inverse synthetic aperture radar works in a similar way, but with a different spatial relationship between the flight path and the target. There are passive sensing techniques that take measurements over time, using multiple synchronized sensors. Astronomical techniques such as very long baseline interferometry use multiple sensors that move with the rotation of the earth, with the sensor moving either with the rotation of the earth, also inspire earth-oriented technique; after all, everything an astronomer observes is remote. Microsatellite constellations use multiple synchronized sensors in earth orbit. Sensors may be framing or scanning or synthetic. A framing sensor, such as a conventional camera, records the received radiation as a single object. Scanning systems use a detector that moves across the field of radiation to create a raster or more complex object. Synthetic systems combine multiple objects into a single one. Most sensors will create digital recordings or transmissions, but specific cases might use film recording, analog recording or transmissions, or even more specialized means of capturing information. Whisk broom or spotlight sensors have the effect of stopping the scan, and focusing the detector on one part of the swath, typically capturing greater detail in that area. This is also called a close look scanner, comparable to a telephoto lens on a camera. ↑ National Academy of Sciences Commission on Geosciences, Environment and Resources (April 29-May 2, 1991). Symposium on Naval Warfare and Coastal Oceanography. This page was last modified 02:59, 10 February 2011.